Warning: this post is about excess. It’s admittedly a little bit obnoxious and over the top, as I’m dedicating it to the two of the most decadent things I can think of a pairing so good that once you’ve indulged in them together, you are not likely to ever feel right again having one without the other. 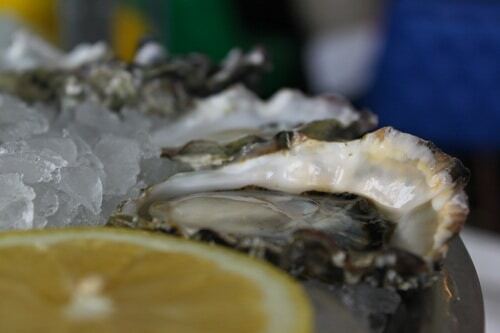 I am of course speaking about chilled, refreshing raw oysters and a stiff, olive-soaked martini. Strong, saline, and utterly perfect. To me, this is the ultimate last meal in a city that I love and am soon about to leave, so why not go all out? It was here that, despite growing up in New England, I was first introduced to the wondrous thing that is the oyster. I guess it’s fitting since New York is home to all the good stuff: $800 Louboutins, penthouse apartments and $500 meals. Thank goodness I fell for a slightly more affordable vice. After my first slurp, I was completely hooked and it has somehow become emblematic of New York for me ever since. In addition to total overindulgence, my thoughts are turning to other things I love about living here, like low-key late summer afternoons with a great friend and food partner in crime, the wonderful Casey Barber, and sneaking away from work on a Friday to grab a table at what would be an otherwise mobbed restaurant just before the madness starts. It’s a magical little window of time when there are no waits, no crowds and phenomenal happy hour deals. If you are a New Yorker, you know these moments are a rare gift, when you feel like the city is all yours. These stolen afternoons are just one of the many things I will miss dearly as I make my way to London with my fiancé (another fantastic food partner in crime). Really, who am I to complain? 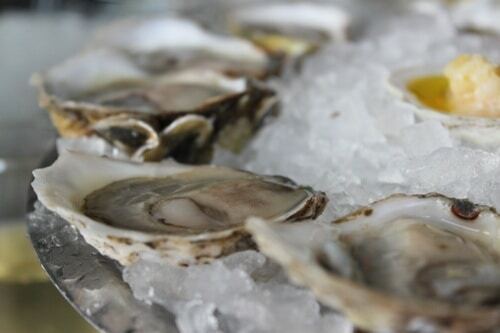 There is a lot of good food and drink, and no doubt many other oysters for the slurping and properly stiff martinis for the sipping, in my future. But there is something special about these moments and the little indulgences I have come to appreciate since moving here eleven years ago. So for one last lazy (and slightly boozy) Friday afternoon, Casey and I chose The John Dory Oyster Bar as the perfect spot for a good-bye toast. They have a terrific $10 happy hour oyster special and we were treated to a half dozen rich, silky Naked Cowboys from Long Island (actually named after the Times Square Naked Cowboy) and a half dozen lovely and delicate Stellar Bays from British Columbia, accompanied by an oyster shell filled with a petite mound of pickled horseradish and one with cilantro-jalapeño mignonette. 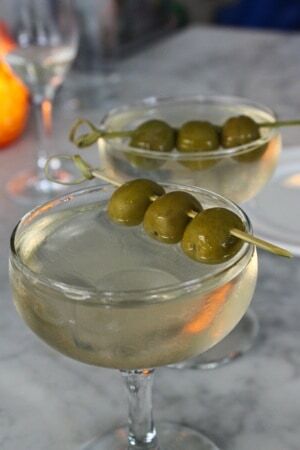 A crisply made vodka martini is the ideal cocktail for washing down these bivalves, picking up the brininess of the oyster while adding a dash of acid and extra punch of flavor. Smartly, we decided we needed a few more nibbles to soak up that martini (extra dirty, please) and chose the dense smoked haddock terrine along with morels and whelks on toast drenched in a potent parsley and garlic cream sauce. We Europeans know that a toast isn’t good luck unless you look your companion straight in the eye as you clink your glass. So we raised our coupes and our oyster shells to the past decade of New York indulgences and sent them off with a meaningful glance and a fond sigh, while looking ahead with hope to new adventures in London.